First, before I forget: National Punctuation Day is coming up on Saturday. I confess, I was initially confused by this announcement because I was sure I had already mentioned this on the blog (and this blog didn’t exist last September). But I soon realized that I was confusing National Punctuation Day with National Grammar Day. Two totally different days. This blog probably isn’t the place to discuss how funny the ‘National [fill in the blank] Day’ phenomenon is, but I can’t resist. August 15th, for instance, is both National Relaxation Day and National Failure Day, a combination that sounds weird but actually makes sense in a mean, puritanical sort of way. It is also National Lemon Meringue Pie Day. Again, there is a certain logic: if you’ve ever made such a pie, you probably needed to relax afterwards and you may very well have failed. Here is a list of more of these special days (I was tired after reading just the month of January) and some discussion of the procedure for getting such a day recognized (just kidding, there is absolutely no procedure). But even though there are national days of many inconsequential things, this does not lessen the importance—the 365-days-a-year importance—of punctuation. I urge you to click here to learn more about its special day. Now, on to today’s post. Since I have encountered a range of thought-provoking blogposts on academic blogging recently, I thought I would devote this post to that topic. Here is a blogpost on the darker side of blogging by Jeffrey Cohen from the In the Middle blog. Cohen reflects on the challenges of maintaining an online presence; in particular, he does a good job articulating some of the hazards that arise when exposure exceeds accountability. Ultimately, he intends to continue to engage social media as part of his academic life, but he is clearly concerned that online negativity could eventually overwhelm the tremendous promise of online communities. Finally, here is something on blogging from The Thesis Whisperer in which a guest author, Andy Coverdale, talks directly about the role of blogging in the life of a PhD student. In particular, Coverdale considers how blogging affects both his writing process and the potential professional reception of his work. This post is essential reading for any graduate students trying to evaluate the benefits and complications of adding blogging into their professional lives. P.S. I just learned that today is National Pecan Cookie Day. Do with that information what you will—I know what I’m going to do! Happy Solstice! As we enter into summer, everyone is thinking about how to write productively over the coming months. Here is a post from The Thesis Whisperer blog on productivity through peer pressure. In this post, the Thesis Whisperer herself (otherwise known as Dr. Inger Mewburn) tries out a strategy called “Shut Up and Write”. This approach has people meet up in public spaces to write, taking advantage of the pressure of working in groups and the value of getting out of our normal writing places. And here is a post from the Hook and Eye blog on a paid service that offers writers support and enhanced accountability. Both approaches speak to the difficulty of mastering writing challenges all by ourselves. Different writers will, of course, need different types of support, but it is worth spending some time now thinking about how you will work productively before you end up with that familiar end-of-summer regret that you didn’t get more written. This piece from The Scholarly Kitchen discusses the idea of ‘the editorial fallacy’; in Joseph Esposito’s words, the editorial fallacy is the idea that “all of a publisher’s strategic problems can be solved by pursuing and publishing the finest books and articles.” While this may not seem directly relevant to the task of academic writers (i.e., to the task of actually writing the finest books and articles), I still think it is important. We can all benefit from Esposito’s awareness that editorial quality isn’t necessarily the most pressing issue facing scholarly publishers in a world with dramatically new technological and financial challenges. Finally, here is an interesting account of a new direction in scholarly publishing: an article from Inside Higher Ed by Alexandra Juhasz about her creation of a ‘video-book’. Since this publishing endeavour was so innovative, Juhasz was operating with a certain amount of freedom. She used that freedom to engage in a very thoughtful consideration of the demands and obligations of scholarly publishing. Any writer could benefit from thinking about Juhasz’s list of publishing considerations: the ideal medium for a given project; the nature of the audience; the reading preferences of the target audience; the desired style of writing; the degree of commitment necessary from readers; the collaborative nature of publishing; the legal considerations; the question of authority; and the ongoing challenges of funding scholarly production. In my last post, I mentioned that I was taking a week off from this blog to attend a conference at which I would be making a presentation about this blog. Since I have been so preoccupied with thinking about blogging, I thought I would devote today’s post to a consideration of how blogging relates to other academic activities. The blog allows me to craft my ideas into a form that endures outside of a particular class setting (blogging as permanent). The blog allows me to reach a broad number of people with whom I might otherwise have no connection (blogging as public). The blog allows me to share my thoughts in short bits at frequent intervals (blogging as periodic). The blog allows me to express my ideas in whatever way I choose without going through anyone else’s editorial process (blogging as personal). Looking at these four themes together, I think it is possible to think of academic blogging as the creation of a hybrid space that combines aspects of traditional publishing (because it is permanent and public) and aspects of teaching (because it is periodic and personal). This hybrid space seems to be well suited to meeting the needs of graduate students who want to improve their academic writing skills: because it is public, a blog can be accessed whenever readers need it; because it is periodic, a blog can provide readers with information in manageable bits; because it is permanent, a blog can give readers the opportunity to pursue an issue further through earlier posts on related topics; and, finally, because it is personal, a blog can adopt a clear authorial stance that allows readers to determine whether it suits their writing needs. The conference itself was great. 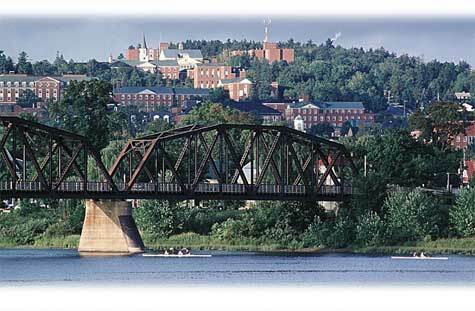 Thanks to all CASDW members for an interesting and congenial weekend in Fredericton! The blog PhD2Published recently ran a three-part series on journal article publishing: getting started; choosing a journal; and dealing with rejection. If you are thinking about publishing for the first time, it is a great idea to expose yourself to as many sources of information and opinion as you can; this blog has an extensive list of academic publishing resources. If you are working in the sciences, you may also be interested in this piece from Science on publishing in scientific journals. This blog post from The Scholarly Kitchen discusses the new paywall at the New York Times. The author points out that the paywall allows the paper to charge organizations for access. While some individuals may get around the paywall by accessing Times’ stories through social media or blog readers, institutions will pay for subscriptions, giving the Times the financial support it both needs and deserves. Here is a blog post from The Scholarly Kitchen that discusses some of the strengths and weaknesses of cascading peer review. In cascading peer review, a journal will forward a rejected article (and its peer reviews) directly to another appropriate journal, thereby allowing the article to be considered by a new journal without the author having to repeat the submission process. This practice certainly isn’t standard but has been adopted by some larger publishers. Friday, March 18 will be a Day in the Life of the Digital Humanities: “A Day in the Life of the Digital Humanities (Day of DH) is a community publication project that will bring together digital humanists from around the world to document what they do on one day, March 18th. The goal of the project is to create a web site that weaves together the journals of the participants into a picture that answers the question, ‘Just what do computing humanists really do?’ Participants will document their day through photographs and commentary in a blog-like journal. The collection of these journals with links, tags, and comments will make up the final work which will be published online.” Click here for an interesting collection of definitions of the digital humanities. I am planning to participate in this project, so I’ll discuss that experience in a future post. Finally, here is a lovely blog devoted to dissertation research presented in the form of haiku. What makes this blog so enjoyable is that each contributor also provides a more conventional explanation of their research, allowing us to compare the poetry to the prose. I offer this link as more than just entertainment: I suggest trying it at home. Anything we can do to get at the essence of our research (even reconfiguring it as a 17-syllable poem) is likely to give us further insights into our own projects. Happy National Grammar Day, everyone! Needless to say, it is always grammar day around here, but I am glad all of you get to join in the fun once a year. If you click the link, you’ll find grammar day e-cards, a theme song, a recipe for the grammartini, an exposé of common grammar myths, and even merchandise! From The New Criterion, here is a review of Fowler’s A Dictionary of Modern English Usage: The Classic First Edition. In the review, Barton Swaim discusses a reprint of Fowler’s first edition as a way of revisiting the ongoing debate between descriptivism and prescriptivism. Swaim argues, in effect, that prescriptivism is both inevitable and way more fun. We will always, in his view, go looking for expert opinion about our writing decisions. And those expert opinions will be more stimulating than the bland descriptivist work of academic linguists. I have no trouble with the view that prescriptivism is more entertaining and often more immediately satisfying. However, what Swaim’s highly dismissive account of descriptivism fails to take into account is the possibility that persistent exposure to descriptivism might actually change the way we approach questions of usage. That is, a dominant descriptivist view might discourage our belief that all educated writers should use language in only one way and that all deviance from that way is deficiency. It may be unsatisfying to be told that a particular usage will be acceptable to some readers and unacceptable to others, but that may be all we, as writers, can hope for: a sound description of current practice to help us make up our own minds. From Inside Higher Ed, here is a review of Siva Vaidhyanathan’s book The Googlization of Everything (And Why We Should Worry). The review includes an interview with Vaidhyanathan, who offers a clear-eyed case that Google’s ubiquity is significant. If everyone gets their information via Google, it matters how Google’s search standards are constructed. Despite its title, the book is clearly less a condemnation of Google, more a call for greater public conservancy of the wealth of human knowledge; Vaidhyanathan is urging us to have a serious discussion about the responsibilities and risks of the digital scholarship era.